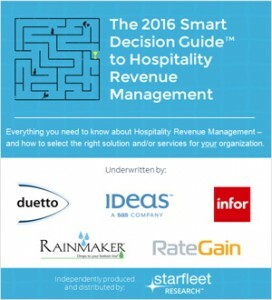 Starfleet Research, the IT market research arm of Starfleet Media, has announced the release of The 2016 Smart Decision Guide to Hospitality Revenue Management. The guide is completely revised and updated from the 2015 edition, which was accessed not only by revenue management executives at hundreds of leading hotels, resorts and other lodging properties around the world but also by other hospitality executives planning to upgrade their revenue management capabilities. As with the previous edition, The 2016 Smart Decision Guide to Hospitality Revenue Management provides a detailed roadmap for achieving increased hotel occupancy, revenue and profitability by leveraging next-generation revenue management technologies and capabilities. The key takeaways include insights for understanding how the practice of revenue management is evolving with recent technology innovations. The guide provides frameworks for evaluating and selecting the right solution and/or services in the context of a hotel or resort’s specific needs. It also offers practical advice, including perspectives from hotel executives, for putting the right organizational resources, business processes and performance metrics in place to help drive continuous performance improvement. The research is based on data collected from 137 qualified survey respondents across different geographies, different types of lodging properties and different levels of the organization. The content was independently produced, providing for unbiased, fact-based information. The underwriters of the new Smart Decision Guide include Duetto, IDeaS (a SAS company), Infor, Rainmaker and RateGain, all of which rank as industry leaders and all of which also participated as underwriters of the previous edition. The 2016 Smart Decision Guide to Hospitality Revenue Management is now available for complimentary download. It can be accessed here. The 2015 Smart Decision Guide to Hotel Property Management Systems, which can be accessed here. The 2015 Smart Decision Guide to Restaurant POS Systems, which can be accessed here. The 2015 Smart Decision Guide to Retail Management and POS Systems, which can be accessed here. Smart Decision Guides serve as definitive resources and required reading for decision makers researching selected niche markets with the intention of making a purchase decision. The content is independently produced, without editorial involvement from company underwriters, providing for unbiased, fact-based information and buying recommendations. To access Smart Decision Guides and other valuable resources from Starfleet Research, please visitwww.starfleetresearch.com. This post was posted by the admin team, with link back to the article source with no clear author information where we support any author claim, and we will be happy to give credit back to any copy rights clammier. Continuing our look at What’s New in Hotel Revenue Management Systems, this time we cover two more stars on the software horizon, both traditional and cloud-based.